This Whole grain crepe recipe contains affiliate links. We recommend only what we love. Crepes are delicious and I enjoy eating them quite a bit! This is the reason why I like to make them healthier and came up with this healthy recipe for Whole Grain Crepes! The Whole Grain Council says there are many benefits of including whole grains into your diet. Studies show that people who eat whole grains have a lower stroke risk. You may also lower your risk of developing Type 2 diabetes, heart disease and you may be able to maintain your weight better than those who do not eat whole grains. There has also been recent studies that indicate whole grains might reduce the risk of becoming asthmatic, they may make your cartoid arteries and blood pressure levels healthier as well as reduce the risk of inflammatory disease, colorectal cancer as well as gum disease and tooth loss. Those are some pretty great health benefits! Now let’s get to the Whole Grain Crepes recipe! In a large bowl, whisk the flour and eggs. Gradually add in the milk and stir well. Add in the salt and butter, then beat until the batter is smooth. If it seems to be too thick, then you can add in some milk. Heat your frying pan for 15 minutes. Put either cooking spray, margarine or butter in the frying pain. Pour one large scoop of the mixture into the frying pan and tilt the pan in a circular motion so the batter coats the surface evenly. Fill the crepe with your favorite filling. I like blueberries or strawberries with mine! Whole grains can easily be a healthy part of your daily diet and the Dietary Guidelines for Americans, which was released in January 2011, recommends adults eat at least 3 to 5 servings of whole grains each day. Children should be eating at least 2 to 3 servings daily. Canada’s Food Guide has similar recommendations. Even with these guidelines, statistics show that Americans eat less than one daily serving of whole grains and over 40% never eat even one healthy recipe that includes whole grains. Everyone wants to improve their health and reduce the risk of health complications and diseases in the future. Preparing wholesome foods may also help prevent childhood obesity. A healthy recipe including whole grains is one of the easiest ways to do that. You can create a healthy recipe by simply replacing white flour with whole wheat flour. Easy and nutritious! What are your favorite ways to make crepes healthier? Check also our basic batter crepe recipe too and our Whole Grain Chocolate cookie recipe. It’s not my first time to go to see this website, i am visiting this website dailly and obtain good facts from here all the time. would really make my blog jump out. Please let me know where you got your design. I love making crepes but have never tried whole grain. This recipe looks fantastic and I can’t wait to try it sometime. Looks delicious. My kiddos (and me too) would love this. We all loved them! I’m sure you and your kids will too! It was a great way for the kids to have fun while eating them! There are so many things you can fill them with! I love how versatile they are. Thank you, Ellen! 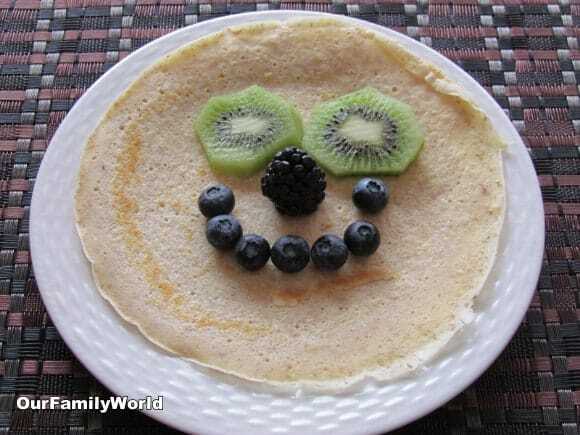 We love crepes and since my kids enjoy fruit, it is a good way to get them a good healthy breakfast.